Our vision is to have a healthier world where people take responsibility for their own health and the planet. Since our first store opened at Shangri-La mall in 1995, our customer advisors have dedicated themselves to achieving our vision through educating and empowering our customers. 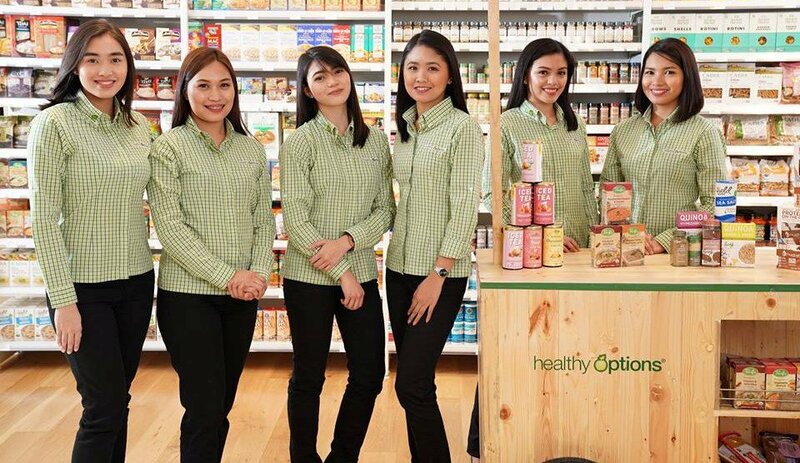 The success in establishing Healthy Options as the premier all natural products store chain in the country has been made possible by our dedicated people. To build on this success, we will continue to focus on providing world-class customer experience and innovative natural products and services. Join us to continue and expand the contribution Healthy Options is making to society. In return, we will teach and prepare you to manage your own business. How soon you achieve this is entirely up to you. From cashiering to merchandising, from planning to operations, from brand management to people management, you will learn all the skills and secrets of how to be your own boss in a retail environment. Moreover, you will receive above average starting salary and benefits including medical and life insurance after a successful probationary period. Provide superior customer service by understanding customers' health conditions and requirements. Answer queries and provide complete and accurate product information and benefits carried by the Company. Generate sales and assist in retail operations management. Perform other administrative tasks that may be assigned by the Store Executive. Participates in all improvement and engagement programs and initiatives implemented in the store. Bachelor's Degree in Pharmacy or Clinical Pharmacy. Experience in handling cosmetic products is an advantage. Strong customer service orientation, assertiveness, and confidence. Living a healthy lifestyle and is a non-smoker.